The Box object is an invisible container which can contain other widgets. It is the only object other than App which can act as the master for other objects and can have its own layout manager. You can use the Box object to group other objects within your GUI. grid List None - [x,y] coordinates of this widget. This parameter is only required if the master object has a grid layout. border int None No Sets the border thickness. 0 or False is no border. True or value > 1 sets a border. You can call the following methods on a Box object. set_border(thickness, color) thickness (int), color (color) - Sets the border thickness and color. Setting thickness to 0 will result in no border. border int The border thickness, setting to 0 or False (the default) there is no border. A Box object is invisible, but it can contain other widgets. In this example, there are two Text objects. 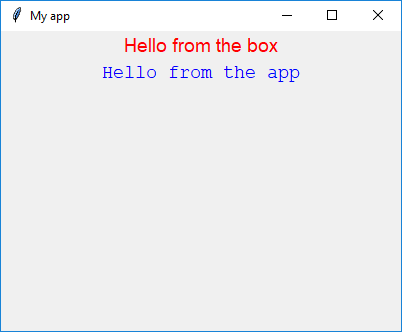 One has box as its master, the other has app as its master. It is useful to put objects in a box to group them together. 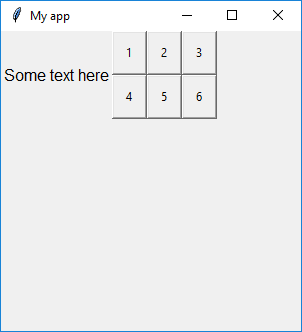 For example here we have given the app a grid layout, then placed some text at [0,0] and the Box object at [1,0]. This means that the text will appear on the left, and the contents of the Box will appear on the right. The Box object itself has a grid layout and contains six buttons which are positioned on a separate grid layout belonging to the box.